Feeler is a design concept included in a design research that seeks for solutions to help people reflect on their wellbeing and learning. 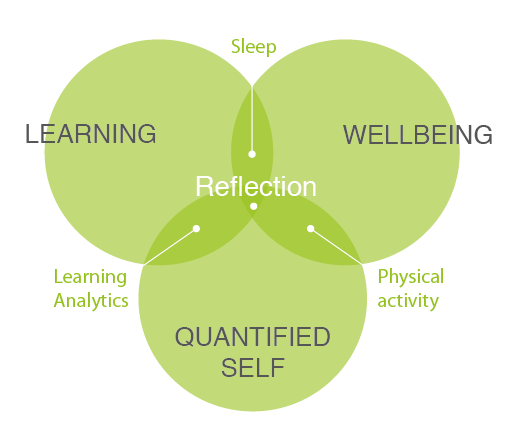 The aim of the project is to develop a tool for visualizing learning performance and wellbeing drawing on data collected from online learning services and quantified self tools. Despite nowadays’ digital technologies allow data collection about many different aspects of people’s life, making sense and reflecting about these large data sets is not an easy task. Data visualization can be a powerful tool for allowing users identify patterns, establish comparisons and identify relations. Unfortunately, quite usually the visualization of users’ data just gives a general overview of the activity progression, rather than helping the reflect about what has led to the state of things and thus be able to – hopefully – change their behavior in an educated way so they can accomplish what they would like. In learning, Learning Analytics are regarded as a promising area for improving teaching and learning based on the students activity data. However, in many occasions Learning Analytics tools are targeted to teachers, forgetting that learners could greatly benefit of the data gathered. In this regard, developing awareness about which are our own strongest points, what skills are we missing or at what times of the day we are more able to focus, is extremely valuable. The Feeler design concept takes things step further than Learning Analytics and explores what would happen if we combine Learning Analytics with Quantified Self data (that’s to say data about our habits, states and inputs) that represent the level of wellbeing of a person. To what extent sleeping 7 hours per day affects my learning activity? Do I get more focus after doing 45 minutes exercise? The answer to these and many other questions can help us better know ourselves and improve the way we feel and manage our learning. 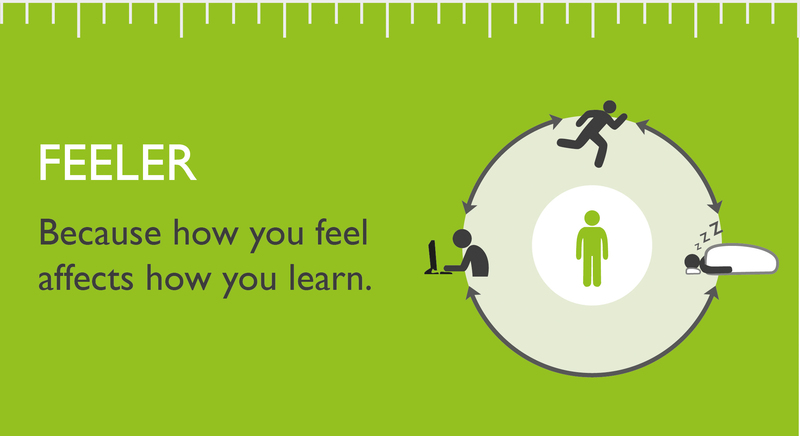 Feeler, still work-in-progress, seeks to enable learners to capture and visualize data about their wellbeing, such as physical activity and sleep, with their learning activity. The identification of these areas has been done according to end-users feedback through interviews and workshops. However, it is necessary to narrow more the kind of data most useful in order to develop insights. Is it enough to track the amount of sleep per night or do we want also data regarding the quality of our sleep? To what extent do we need to combine quantitative and qualitative data to get a clearer picture of how are we doing in our studies but also in our wellbeing? One of the project key questions is: how to design for reflection? What tools should be provided to users in order to enable them develop deep understanding so they can identify general aspects, but also the hidden relationships? Little by little some concepts are being narrowed, but certainly there is still much to carefully look at. So, please feel free to add your comments or suggestions regarding what would help you achieve a better understanding of your learning in relation to your daily practices. Thanks!